The Pee Dee Chapter of Credit Unions held its annual Legislative Night on Tuesday in Florence, SC. The evening included a networking social followed by greetings from elected officials which included state Representatives Jay Jordan (R-Florence) and Robert Williams (D-Darlington). Reps. Jay Jordan (left) and Robert Williams (right) speak with members of the Pee Dee Chapter of Credit Unions at the Legislative Night on Tuesday, Sept. 11, 2018. 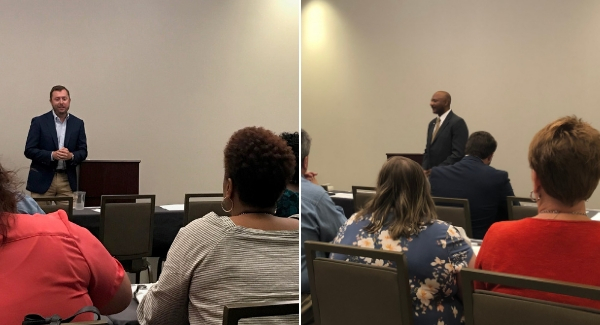 Both representatives shared the latest news on what’s happening at the State House, and the significance of passing the S. 337 bill, which updates the SC Credit Union Act.